Alan, as usual very timely and accurate information. Each time I read your blog I'm hopeful for a little bit of optimism, unfortunately the news is never good and continues to get worse. After 35+ years in media planning and placement it's time to offcially put this medium out of its misery. and also meekly reported here in the New York Times in which the lede, i.e. that outgoing CEO Janet Robinson is taking home $24 million, is buried in the third-to-last sentence: http://mobile.nytimes.com/article?a=940685. I would also like to put to you (and anyone else who cares to weigh in, particularly those still working under the legacy business model, if they're even allowed to comment on your blog anymore) the question of why there isn't open revolt in the newsroom? Oh wait...I think I know...is it because nobody is left to revolt? Interesting, but this is based on a lot of national ad spending and not quite relative to newspapers, which are more of a local business. 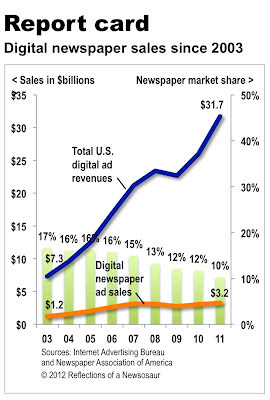 When you look at "local" digital dollars it's a much better story for the newspaper industry. Newspapers have been holding steady at 24-25% of all locally spent online advertising -- more than any other media except the pureplay Internet companies themselves (who are losing share). True, newspapers dropped from holding a 44% share in 2004 to 25% in 2011, but the good news is that they stopped slipping two years ago...and stand a good chance of gaining ground. Hmm. My first thought after looking at that graphic is how it would compare to similar graphics for various industries that are also offering digital ads. 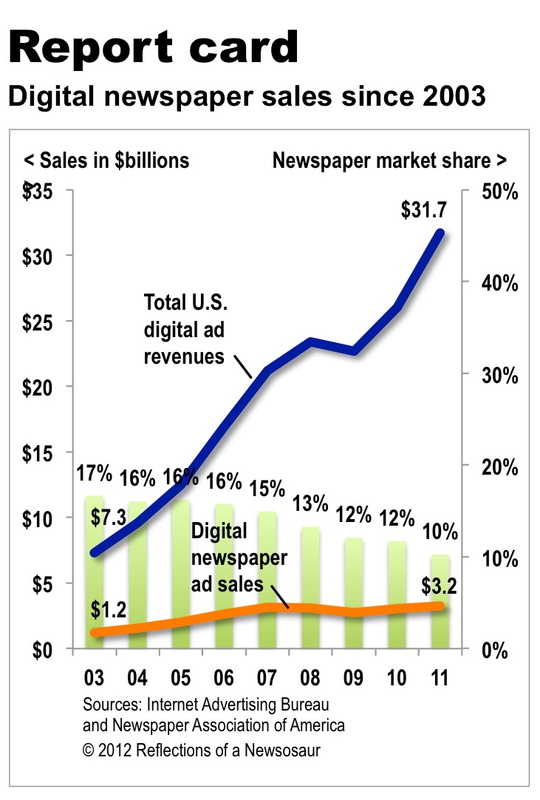 In addition, it makes me curious as to what percentage of revenue has been invested in advertising infrastructure on newspaper sites over this time period compared to other online sites? When the business landscape is changing, one *must* make a decision if you are going to change with it or not. Sometimes, late adopters pay a very heavy price. Thanks for posting this great info.